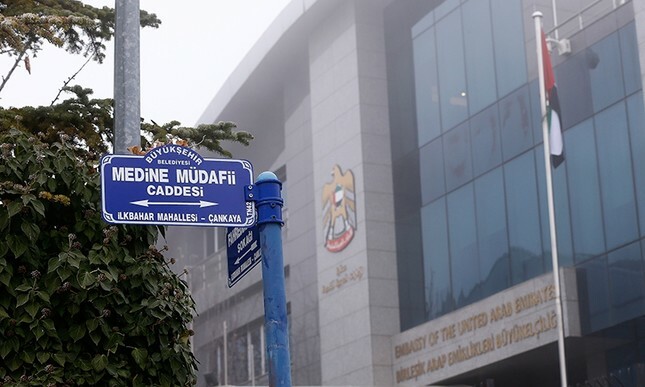 New street signs were installed Tuesday at the intersection near United Arab Emirates' Embassy in Ankara after the two streets were renamed to honor an Ottoman military governor of Medina. The street where the UAE embassy is located was renamed after Ottoman commander Fahreddin Pasha, who defended Medina during World War I, while an intersecting street was renamed to "Medina Defender Street." The renaming came after UAE's Foreign Minister Sheikh Abdullah bin Zayed al-Nahyan shared a post that accused Ottomans of committing crimes against the locals in Medina during World War I.
Nahyan retweeted a post on his official account from an Iraqi man living in Germany, according to his profile, which said: "Did you know that in 1916, Turkish Fahreddin Pasha committed a crime against the people of Medina, stole their properties, and put them on a train en route to Damascus and Istanbul? Also the Turks stole the handwritten books in Mahmoudia Library and took them to Istanbul. This is the history of Erdoğan's ancestors and what they did to Muslim Arabs." The remarks received harsh criticism from top Turkish politicians, including President Recep Tayyip Erdoğan, who said the Ottomans had done nothing but serve to protect the holy cities of Islam. "To the poor fellow slandering us, where were your ancestors when Fahreddin Pasha was defending Medina?" President Erdoğan questioned Nahyan. A few days after the Emirati minister's provocation, Ankara Mayor Mustafa Tuna decided to rename the 613th Street, where the UAE embassy is located, as a reaction to the incident. The decision to rename the streets was taken unanimously Monday by Ankara Metropolitan Municipal Council. Afterwards, Nahyan, a deputy chief of police in the Emirate of Dubai, posted a series of tweets critical of Turkey and Qatar, Ankara's top ally in the region. The UAE, on the other hand, has been accused of supporting plots in Turkey against the Turkish government, including the July 15, 2016, coup attempt of the Gülenist Terror Group (FETÖ) as well as against Ankara's role in the broader region. The two countries also do not share the same view on the recent crisis in Qatar, which has been involved in a bitter spat with its Gulf neighbors. Turkey has voiced its support for Qatar as some regional countries, including the UAE, imposed sanctions on the country, claiming that it was ignoring terrorist activities. Turkey summoned the charge d'affaires at the UAE embassy in Ankara, after the UAE foreign minister accused Turkish troops of looting the holy city of Medina a century ago. That tweet was referring to the three-year-long defense of Islam's second holiest site Medina by Ottoman Turkish troops, who were commanded by Fahreddin Pasha during World War I, against rebelling Arab tribes backed by the British.